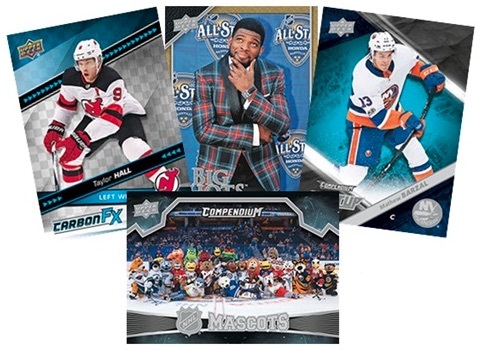 Blurring the lines between digital and physical NHL card collecting, 2018-19 Upper Deck Compendium Hockey offers a massive digital base set with physical parallels and achievement cards. Year three for the ePack exclusive decreases the series total from three to two main releases but leaves the overall set size intact. The eight-card packs sell for $0.99, while 24-pack boxes are $22.99 and 12-box cases run $269.99. 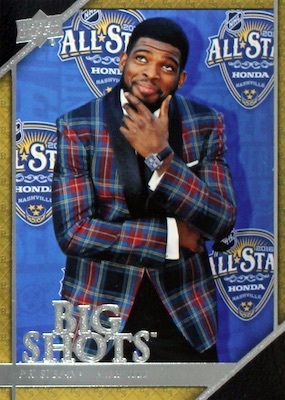 Switching up from 2017-18, the 900-card base set is now issued in two groups of 450 cards. That includes double-digit representation from every team and many top rookies. In addition, Magenta parallels average 1:3 packs. Inserts include Big Shots (1:8 packs), Carbon F/X (1:6 packs), Mascots (1:4 packs), Next Up (1:8 packs), and Silver Linings (1:288 packs). While these base cards, Magenta parallels and insert cards are digital versions that can't be owned in the traditional sense, they can be "collected" on ePack to redeem physical cards. Those looking for something they can hold in their hands are in luck as the 2018-19 Upper Deck Compendium Hockey checklist offers all base subjects in physical form. However, the only cards that actually come in packs are the one-of-one Printing Plates. Collectors can redeem physical base parallels by obtaining specific quantities of base cards. To make a Blue version, you need 10 of the same base cards. And 20 Blue parallels can be used to make one Gold parallel. 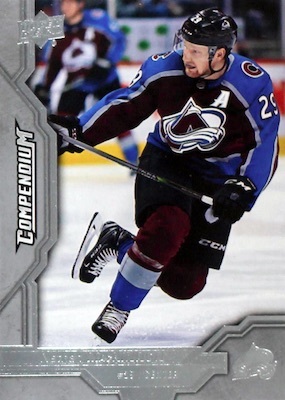 On top of that, the various achievement cards in 2018-19 Upper Deck Compendium Hockey are earned by building sets. 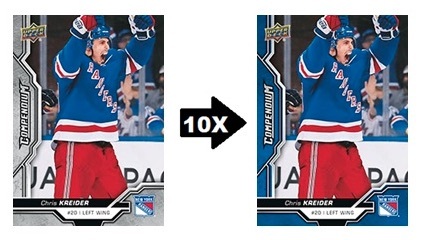 ePack fans must collect each 450-card set to redeem four Base Set SP Achievements. These can also be earned in Blue, Gold and Magenta. Once you collect SP1 to SP4 for Series 1 and SP5 to SP8 from Series 2, you can redeem them to unlock the SP9 and SP10 cards. Similarly, collecting the full sets of the inserts yields a special Insert Achievement card for each. If you collect all insert sets from Series 1 and Series 2, that can be used to obtain the Grail Glory Achievement card in honor of the Washington Capitals title. 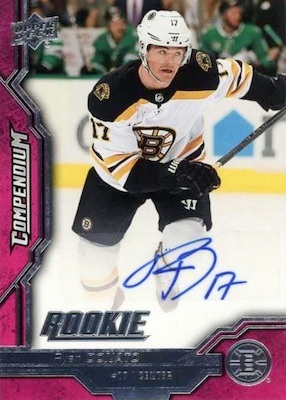 The toughest achievements in 2018-19 Upper Deck Compendium Hockey award signatures. 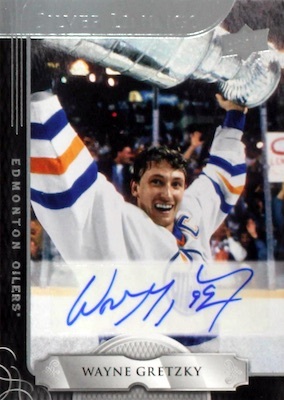 The first 10 collectors to complete the Silver Linings inserts are eligible for the Silver Linings Autograph Achievement featuring Wayne Gretzky. Finally, the first 10 collectors to redeem the Magenta parallel for Base SP Achievement SP9 and SP10 earn the four-card Magenta Parallel RC Auto Achievement set, while the next 68 collectors earn one random autograph from the set. 900 total cards with 450 per series. Shop physical parallels on eBay. Physical autograph cards earned by building digital sets. I really love this product from Upper Deck. It’s inexpensive and great to collect and earn achievement awards that you can physically get shipped to you. Just wondering if you have any update on Series 2, Trey ?? No word on Series 2 yet.